When he was 35, Colin Brownlee had an epiphany -- a life-changing moment. He was staying at a small hotel on the beach, on Hawaii's Big Island. The landscaping was lush and tropical, there were hammocks slung between palm trees. "It haunted me that I might not do it because of fear of failure," says Colin. "When I turned 40, I didn't want the second half of my life to be all about the money, so I started planning seriously." The plans paid off and today you'll find Colin, now 51, at the Banana Azul, his beachfront hotel on Playa Negra, just north of Puerto Viejo de Talamanca, on Costa Rica's southern Caribbean coast. After six years, he couldn't be happier. "As I get older, I have amazing gratitude," explains Colin. "If I could be anywhere in the world, doing anything I wanted, if money was no object, I would be here." When searching for a spot for his hotel from his home in Canada, Colin looked worldwide. "My idea was first born in 1996," says Colin. "From that point on, I did a lot of research and things kept pointing to Costa Rica mainly because of its location, beauty, stability, and easy access to North America." He found Puerto Viejo on the Internet and first visited in 2003. "I saw it had a funky bohemian atmosphere. I like living in those types of places. When I came to check it out, it exceeded my expectations," says Colin. "Then I went all over Costa Rica, as well as Granada, Nicaragua. Samara on Costa Rica's Nicoya Peninsula was a runner-up. I chose the Caribbean side because I felt it was very up and coming and had diverse culture." Costa Rica's great weather, lush green landscape, and accepting attitude sealed the deal. So he made an offer on the land in 2004 -- it was cow pasture at the time -- and built his hotel from the ground up starting the next year. He drew up the plans himself after rejecting his architect's designs and supervised the work. It's a two-story structure, wood paneled, with a large covered area on the first floor that houses a bar and restaurant. He invested about $600,000 in the initial construction, which took two years. Tropical landscaping surrounds the pool and runs all the way up to the beach. "When the construction crew showed up, my son said, 'Dad, I didn't know you knew how to build a hotel,'" recalls Colin. "'I don't,' I told him. 'Isn't this fun?'" But Colin did give a lot of thought to how to make his hotel special. "And I had some experience in the hospitality industry. At the age of 18, I worked six months as a bellhop," laughs Colin. Banana Azul is a few minutes outside of town, which long-time hoteliers in the area told him was no good. 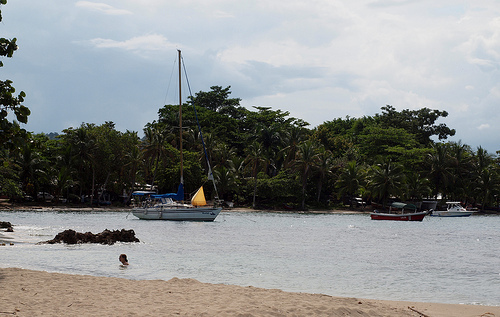 But it's a short bike ride to Puerto Viejo, and it's a quiet neighborhood, the beach nearly deserted most of the time. When he put out beach chairs and hammocks for his guests, the old-timers tut-tutted again --you should charge for those things, they said. Since day one, Colin has been focused on the guest experience. "You have to ask yourself what will make people happy, not, 'How can I make more money?'" says Colin. "We're not renting rooms, we're giving people experiences. That's what they dream about: sitting on the beach with a cocktail, watching the water." And business is good. The Banana Azul, with 15 rooms, has 95% occupancy year-round, says Colin. Guests tend to stay for about a week -- it's an annual vacation for many. Rooms start at $89 a night for double occupancy, with suites going for $139 and up. He does most of his marketing online, through ads as well as staying active in forums and websites on the area. And he has embraced TripAdvisor, which has become a travelers' Bible. His 23 employees keep the place humming. But Colin isn't content to sit back. He's always improving. "Whatever you want, we'll make it happen," says Colin. "You have to tap into people's emotions to give them what they want." "We've only been open six-and-a-half years," says Colin. "But we've had people back for their fifth visit." Colin is in it for the long haul. "I'm just not ready to retire. I'm not a do-nothing person," says Colin. "I'm a big believer that you need a purpose in life. And right now my purpose is to give people fabulous vacations." And what better setting? "I can't get over is sitting on the beach with a cappuccino... I'm really here," says Colin.